3 - 2.....................Kleo von der Weyermühle. 4 - 3.....................Amor von der Weyermühle. 4 - 3.....................Gina von der Weyermühle. 5 - 4.....................Alfa von der Weyermühle. 5 - 4.....................Ali von Langenhorst. 5,5,5 - 4,4,5.........Bingo von Ellendonk. 5,5,5 - 4,4,5.........Cona von Niederkassel. SchH 2: 98-85-98 = 281 points. SchH 3: 99-83-98 = 280 points. Calle von der Burgstätte passed the ZTP with 1A rating for character and SG for conformation. 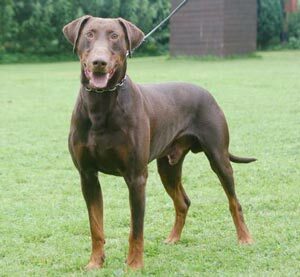 His dam, Brista von der Doberwache (litter-sister to Bronco) passed the Körung with highest rating for hardness and working drives with middle sharpness. His sire, Curd von der Urftquelle, was the FH Tracking Champion of Westfalen in 1997 and passed the Körung with highest rating for working drives and hardness with middle sharpness. Calle tested clear for PHTVL / PHPV and cataracts. His sire lived to 10 years of age and his dam to 11½ years of age. Orthos: SchH 3, FH 2, D.V. Leistungssieger and passed the ZTP with 1A rating for character and SG for conformation.